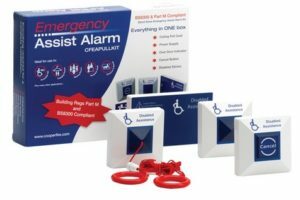 The CFEAPULLKIT Emergency Assist Alarm standalone kit provides the perfect solution for commercial building conformity across multiple uses, including retail, restaurants, offices and hotels in line with the Building Regulations Document M and Equality Act 2010. The simple two wire system has been specifically designed to meet the needs of disabled service users and conforms to all relevant requirements: Disability Rights Commission code of practice, English Tourism Council Recommendations and RNIB signage guidelines. Included: Ceiling Pull Cord, Power Supply, Over Door Indicator, Cancel Button and Disabled sticker.